Home » life » When this woman unbuttoned her shirt, flight attendants reacted without hesitation. What they did then, was not what the young mother expected. 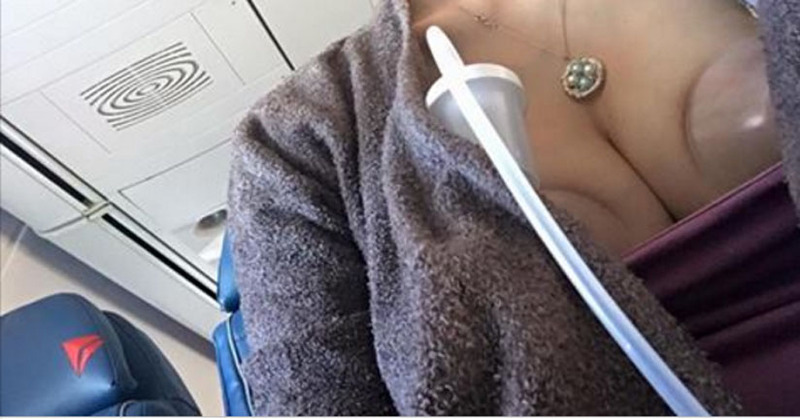 When this woman unbuttoned her shirt, flight attendants reacted without hesitation. What they did then, was not what the young mother expected. Mothers who travel with young children don't have it easy — especially if their little cherubs are still nursing. Jenna Evans, the mother of triplets, can tell you a thing or two about that. Even when her kids don't sit with her on the plane, she has to find a way to take care of them. And that means doing something that can startle her fellow passengers: Jenna has to pump breastmilk. "As a breastfeeding mother to triplets, it's important that I not miss a breast-pumping session, especially when traveling. Yesterday, two flight attendants, Kaitlin K and Loretta, on my flight from Atlanta to Dallas-Love Field, allowed me to sit in an empty first class seat for more space and privacy while I pumped in flight. They offered me snacks and provided TONS of water during my pumping session. Additionally, on my return flight this afternoon, the Dallas-Love Field gate attendant, Talesa, offered me an empty first-class seat so I could do the same. I am incredibly grateful for the lengths these individuals took to make my role as momma much easier and impressed by the advocacy this company has provided for breast-feeding and pumping. Thank you, #Delta for making being away from my babies a bit more bearable!" Under Jenna's post, numerous other Delta customers reported comparable stories. One mother wrote about how a flight attendant offered her the option of pumping breastmilk in the employees' bathroom, though she wasn't even flying Delta. When it comes to great customer service, it sounds like other airlines could take a page from Delta's book!